As customers follow OSHbot to the correct aisle, they will see ads for in-store specials on its back screen as they pass various departments, communicated through in-store beacons. Customers who need help with, say, a specific type of plumbing project can initiate a video conference on OSHbot’s front screen with available experts at any store. OSHbot also can help customers match a certain-size nail or hinge with a 3D-scanner and determine immediately if the part is in stock. In the future, OSHbot may be able to create the part with a 3-D printer. 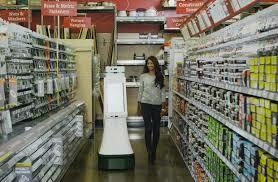 To navigate the store, OSHbot uses lasers to sense its surroundings, the same light detection and ranging system (called Lidar) used by Google’s autonomous cars. OSHbot creates a map of its surroundings using technology called simultaneous localization and mapping that it can refer to later. By matching the map it creates to the store map of where products are located in the store, it can lead a customer to a specific hinge or hammer. The bottom line: There haven’t been more robots in stores to date because the technology hadn’t matured enough, but that is changing.